Developed by Cosworth’s expert engineering team to produce power and torque capable of turning heads on the road and race track, the Stage 2.0 Cosworth FA20 Power Package range delivers an increase of up to 80bhp for the Scion FR-S, Subaru BRZ and Toyota GT-86. A fully validated system that combines intake manifold, intercooler and positive displacement supercharger to create a unique design, the Stage 2.0 FA20 Power Package delivers a consistent increase in engine performance. 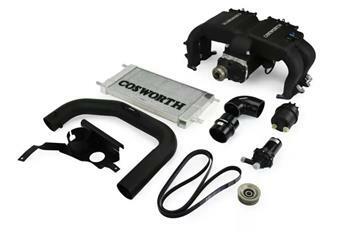 Engineered to the levels of excellence required by Cosworth’s global vehicle manufacturer customers, the Stage 2.0 FA20 Power Package provides excellent throttle response at low engine speeds and a sustained performance increase even in demanding race track conditions. Cosworth in an exclusive partnership with Nameless Performance, have engineered and manufactured manifold to tip, premium quality exhaust systems.